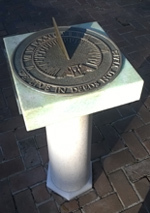 This highly decorated monument sundial is composed of three sundials (Horizontal, Polar and Equatorial) with a common gnomon. All of the dials are built mainly of limestone. The large polar dial (wings), small horizontal dial (tail) and gnomon (body) recreate a “hummingbird”, the universal symbol for diabetes. (The hospital specializing in diabetes is only 500m away). The dials are delineated in half hours and have a variety of graphics on all three dials. 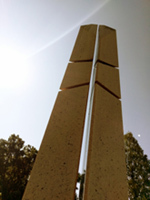 In the same location, albeit separated there is another equatorial clock that is five times smaller and has a custom gnomon in the shape of the "little hummingbird”; this sundial is mounted on top of a column and has been adjusted to the local solar time. Nearby is a plaque with the equation of time. The dial is elegantly painted on the south wall declining 30 deg west. 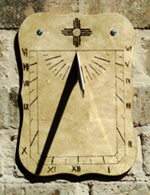 Dial shows daylight savings time using dark red Roman numerals on a golden ribbon banner. The gnomon is a simple rod held firmly to the wall by an ornate bracket. 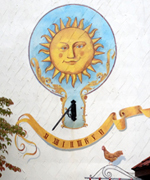 Above the dial is a large smiling sun surrounded by a sky blue band. 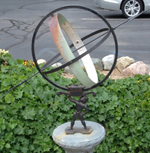 This is a mass produced armillary dial held at the latitude of Frankenmuth by the statute of a boy with raised arm. All this sits on a pedestal with a Greek motif. 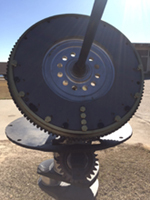 The meridian circle made of iron is about 2 feet in diameter. The equatorial band is about 3 inches wide with some corrosion present. Inside the equatorial there appears to be an aluminum interior band of Arabic numbers riveted to the equatorial. Hours and half hours are marked by dot bumps in the aluminum. There is an iron latitude ring for decoration. 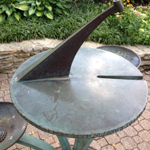 The bronze gnomon extends the meridian circle with both an arrow point and feathered tail. 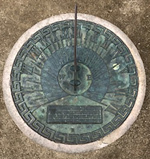 The brightly colored analemmatic dial is approx 10.5 feet in diameter, surrounded by a ring of alternating red and white concrete with cardinal points. Time marks are set in a ring of black concrete, with large engraved hour numbers. Time is adjusted for daylight saving time. [Note that to tell time correctly, the time marks should be set on an ellipse.] The walkway for standing to cast your shadow has monthly names impressed into the concrete. 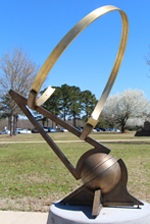 The 21 inches in diameter sundial started as a sculpture. A call went out to the boy and girl scouts (and alum men and women) to contributed fossils, and other artifacts. This included an arrowhead found at camp. These objects were incorporated into the finished wax, with the arrowhead embedded on the style edge at the very tip of the gnomon. 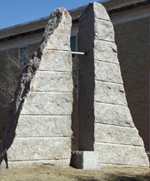 A mold was taken of the completed sculpture and used to create a casting wax replica of the sculpture. This is a small 7 x 10 inch vertical dial declining due south. It is made from wood with hour lines, half hour lines, and Roman numerals engraved using a wood burning tool. The simple gnomon is 1/8 inch steel.